Earlier this year, Vander Mill Cider & Winery completed a 3,500-square-foot, $600,000 expansion at its facility in Spring Lake, Michigan. The expansion included the addition of fermentation equipment and a canning system, which produces 1,800 16-ounce cans per hour. With this expansion, Owner Paul Vander Heide estimates his production will top 100,000 gallons in 2013. Vander Mill Hard Ciders will can three varieties – Hard Apple, Totally Roasted and Blue Gold (formerly known as Apple Blueberry). Distribution of the cans began last week in marketplaces throughout Michigan and will continue to be launched with special tasting events. “We are going to continue our focus on innovation and creativity with our ciders,” says Vander Heide. “But we wanted to take a few of our core products and make them more accessible to the consumer. Our cans should now be available in more independent stores as well as traditional grocery.” Cu rrently, more than 600 retail outlets and 200 bars/restaurants in Michigan and Chicago (IL) serve Vander Mill ciders. In addition to the production expansion, Vander Mill has renovated its 2,500-square-foot tasting room and café, with the introduction of an expanded menu under the auspices of Chef Stephanie Luke. Vander Mill will offer seating for 65 indoors and 100 outside (weather permitting) in a 2,000-square-foot cider garden. 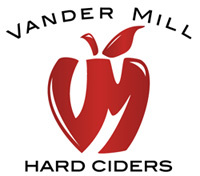 For more information on Vander Mill Cider, please visit their website VanderMill.com. After a year of development, Blue Bee Cider has officially launched in Virginia’s Downtown Richmond – Old Manchester district along the James River to become the state’s first and only urban cider company. The journey was long but productive. Blue Bee’s Owner Courtney Mailey started something out of nothing when she began renovations on the 4,800 sq uare-foot coffee warehouse space that would become the cidery’s production facility and urban orchard in June of 2012. Since then, Mailey has been hard at work pressing apples, brewing and fermenting cider. 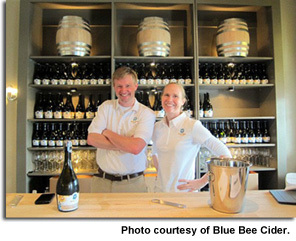 Blue Bee Cider is expected to produce about 1,500 cases from the 2012 harvest. All ciders will be blended from heirloom Virginia apple varieties grown at Silver Creek Orchards in Virginia’s Nelson County where Mailey leases an orchard. 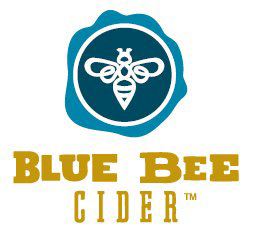 Blue Bee Cider actually gets its name from the blue-colored bees observed pollinating apple blossoms in the early spring. Aragon 1904: a blend of modern and heirloom apple varieties to create a light, crisp, off-dry cider – on tap now! Customers can buy cider by the glass ($6), bottle (between $10.25-$15.50) and case in Blue Bee’s tasting room open from 12PM-6PM on Fridays, Saturdays and Sundays. Those not in the area can also purchase ciders online via BlueBeeCider.com. Blue Bee Cider is not available at any local retailers just yet as Mailey awaits paperwork to self-distribute through the Virginia Winery Distribution Company (VWDC). VWDC Administrator Penny Tuthill told Richmond BizSense that Blue Bee Cider is one of five other new cideries that filed paperwork in the past year alone to self-distribute through VWDC – demonstrating the rapid growth of hard cider in the market. SBS Imports and the Sea ttle Beer Collective (SBC) announced the return of Cider Summit Portland (Oregon) with the expansion of the event to two days. The third annual event will take place on Friday, June 21 from 3PM-8PM and Saturday, June 22nd from 12PM-6PM. 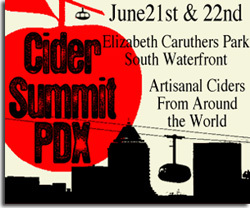 Cider Summit will once again take place at Elizabeth Caruthers Park in the emerging South Waterfront neighborhood near the Portland Aerial Tram. Cider Summit was originally launched in Seattle in September of 2010 and has been ever growing since. Earlier this year, the producers expanded the event to Chicago for the first time and met great success with CiderCon taking place the week leading up to the event. Just like the others, Cider Summit Portland will feature over 60 elegantly crafted ciders from producers in Washington, Oregon, California, Michigan, Canada, England, France and Spain among others. New for 2013, the event producers have added a “dog lounge” hosted by DoveLewis, a bicycle valet from Go By Bike, a Cider Summit weekend hotel package from The Westin Portland, and expanded food selections. Each attendee of the event will also receive a collectible tasting glass versus the plastic stemware used in previous years. The event will continue to feature live music and a “bottles to go” store onsite. The owners and cidermakers of the participating ciders will be on hand to inform and guide guests through the samplings which will be available in four-ounce tasting portions. In addition to the superb range of ciders, the event will feature food from southeast Portland’s Ya Hala Restaurant, sausages from Road Dog, and specially designed filled chocolates fr om Smitten Truffles. Brewvana Brewery Tours will run a continuous loop shuttle from southeast Portland to the park and event producers also encourage the use of the Portland Streetcar to the event. Tickets are available online via Stranger Tickets, at the Umpqua Bank South Waterfront Branch and many of the area’s leading bottle shops for $25 in advance and $30 (cash only) at the door. Admission includes the collectible tasting glass mentioned and eight drink tickets. Additional drink tickets will be available for purchase on site at $2 per ticket. Re-admission will be allowed at any time with the event wristband and tasting glass. The event is 21 and over only. Dogs of all ages will be allowed on the event grounds. Cider Summit Portland is presented by Barbur World Foods and Bushwhacker Cider with supporting sponsors KNRK 94/7 Alternative Portland, Portland Mercury, Maletis Beverage and the South Waterfront Community Relations office to benefit the Northwest Cider Association, the Institute for Myeloma & Bone Cancer Research, and DoveLewis Emergency Animal Hospital. For more information about Cider Summit Portland and/or to see the list of participating ciders, please visit CiderSummit.com. 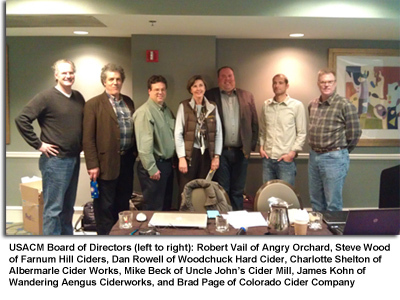 At CiderCon earlier this year, cider makers from across the country came together to lay down the foundation for the United States Association of Cider Makers (USACM) and elected a board to get things started. Now several months later, we’re already seeing the benefits of the USACM. The Legislative Committee has been working to get the carbonation and alcohol levels for cider aligned with the EU standards. The proposed changes were approved in Chicago and the legislative changes have already progressed to a concrete bill sponsored by Senator Schumer of New York. Additionally, the association has already begun planning CiderCon 2014 so they can define all the side issues that will be taken up such as marketing cider, getting information out about apple cultivation and supply, cider making techniques and quality issues, and technical issues of building and operating a cidery. The mission of the USACM is an easy one: “The United States Association of Cider Makers was organized to unite cider and perry producers in the US. 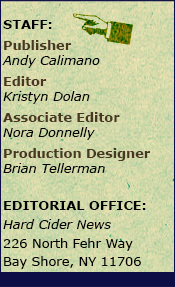 It gathers and shares information about cider production, cider regulations and cider apple growing to help members improve their operations, raise awareness and advance cider in the marketplace.” However, to accomplish this mission the association needs the collective group of cideries, associates and enthusiasts to work together to build the industry. Michael Beck of Uncle John’s Cider Mill and President of the USACM asks you “to join the USACM today to lend your voice to support upcoming proposed legislation, help make the annual conference better and work towards making cider a successful industry in the United States.” Click here to join! Members of the USACM will receive conference discounts as a direct benefit of membership. Note, CiderCon 2014 will take place in Chicago, IL from February 5-8. According to the USACM website, registration is $250 for members and $400 for all others. Grand Rapids, Michigan, is now home to The People’s Cider Co. – a small cidery with a big future. 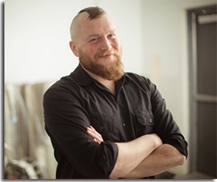 Owner and Cider Maker Jason Lummen has been making cider for over a decade as a homebrewer in his apartment but after much praise finally decided to get a license to brew in a larger capacity. 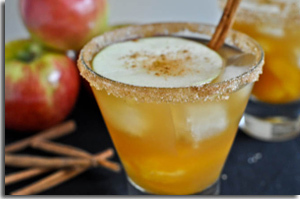 What makes The People’s Cider Co. special? Lummen makes People’s Cider using only Michigan products. It’s the most locally made cider you can get. Lummen told Rapid Growth Media that he uses apples from the Fruit Ridge Farm Market & U-Pick in Sparta, sugar from Bay City, and Michigan yeast. Lummen is in the fortunate situation of being able to buy his apples nearby and press the apples at the orchard since he produces small batch cider. Lummen also self-distributes right out of his personal vehicle since his volume is so small. This makes things easy for him but hard for us – you need to be a close friend or a close neighbor to get a hold of People’s Cider. Currently, People’s Cider Bourbon Barrel Aged Batch #1 is only available on draft at three locations in Grand Rapids. Eventually, Lummen will offer cases but you will be lucky to get it outside of Michigan. Batch #1 (2012) is a bourbon barrel aged dry draft cider with an ABV of 6.9%. Lummen will also make a stronger bourbon barrel aged cider with an ABV between 13-14% along with meads, including a cherry wine. 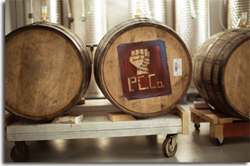 For more information on The People’s Cider Co., please visit ThePeoplesCider.com. Photos courtesy of Adam Bird. Earlier this month, Orig inal Sin announced the launch of Original Sin Elderberry Cider. 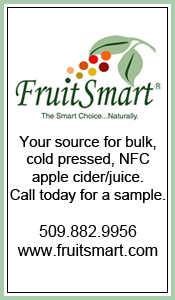 The new cider combines the natural acid and sugar of apples with the tart flavors inherent in elderberries. Select states including Ohio, Florida, Kentucky, Massachusetts, California, Illinois, and Indiana will join the United Kingdom in being the first to see the product available in 12-ounce bottles and kegs. Further market distribution will take place over the next two months when the Original Sin company intends to launch in additional states and overseas markets. Elderberry Cider is made of elderberries – a common fruit used in wine making. It’s unique tart qualities make it an ideal fruit to use in the cider making process. Much of making a good cider is finding the perfect balance between acid, sugar and tannins. With Original Sin Elderberry Cider, the Original Sin company believes it has achieved this balance. Not familiar with elderberries? It’s a flowering plant that is part of the honeysuckle family. In the 1822 book, The American Orchardist, it suggests adding elderberries to give “cider a fine colour as well as flavor.” Elderberries are most commonly used in wine, jam, syrup, teas and pies though. 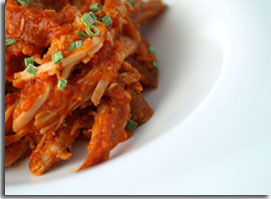 On occasion you might find an entire flower cluster dipped in batter and fried, or the petals eaten raw. Drink and food aside, elderberry has also been used for centuries to treat wounds – when applied to the skin. It has also been taken by mouth to treat respiratory illnesses such as the cold and flu. Some evidence even suggests that chemicals in elderberry may help reduce swelling in mucous membranes, such as the sinuses, help relieve nasal congestion, used to break dry fevers and stimulate perspiration, and aid headaches, indigestion, twitching eyes, and more. Furthermore, elderberry branches and stems have been used to make the shaft of arrows, flutes, whistles, clapper sticks, combs, spindles, pegs and squirt guns because the wood is hard and durable. 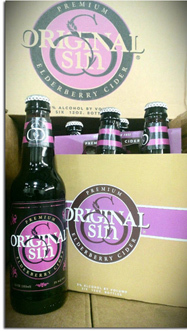 For more information on Original Sin Elderberry Cider, please visit OriginalSin.com.